Within the framework of the lecture series 'Management on the Bar', a meeting on the subject of Decision Making in the New World, hosted Dr Leslie Broudo-Mitts, head of the Sofaer Global MBA program at the Coller School of Management and Dr Julia Shamir, a lecturer on business ethics, in the Sofaer Global MBA program. A meeting, within the framework of the lecture series 'Management on the Bar', titled: From Entrepreneurship to Leadership – Decision Making in the New World, was held at the Tailor Made Bar in Tel Aviv. 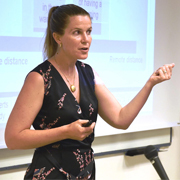 Among the young people participating in the meeting, which was organized by Tel Aviv University’s Coller School of Management, were entrepreneurs just starting out. The guest speakers were Dr Leslie Broudo-Mitts, head of the Sofaer Global MBA program in entrepreneurship and technological innovation at the Coller School and Dr Julia Shamir, a lecturer in the program. The focal issue of the meeting was the price of innovation from the point of view of ethics, that is, the new ethical questions on issues such as invasion of privacy, genetic engineering, and autonomic vehicles that arise from the changes that rapid technological development are bringing about in our lifestyles, consumption habits, work procedures, and communication patterns. 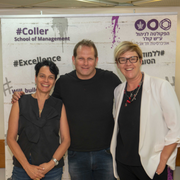 The Coller School of Management at Tel Aviv University holds the 'Management on the Bar' meetings in cooperation with Wize – a social venture that aims to advance science, culture, knowledge and technology for the general public in a format that combines content with recreation.